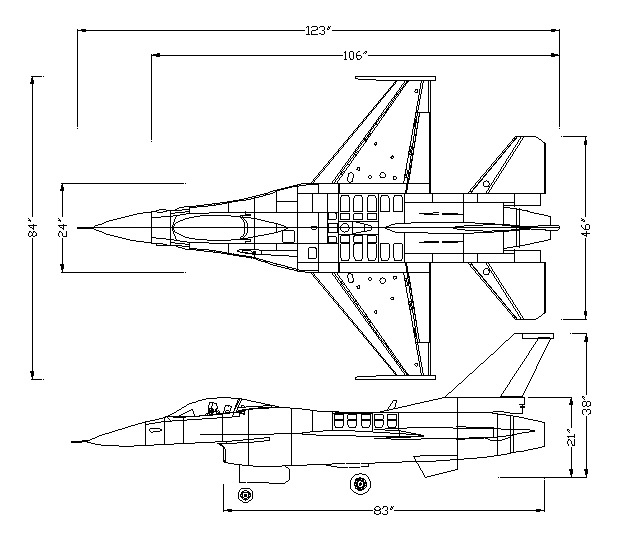 With the Pitot Tube, Nose Cone, and Nose Cone Formers removed, the total length of the 1/5th scale F-16 is 106” or 8.83’.This means the aircraft will easily fit into a 10 ft. long trailer bed. Check the Inlet lip to tail cone dimension for fitting into an SUV. The above items remove very easily by loosening a few screws. The fuse is best stored Gear up, on a 2-3” thick foam mattress topper, for long trailer hauls. The Vertical Fin removes by loosening (3) 9/64” hex head bolts and disconnecting the L.E.D. connector. The Wing Panels remove by loosening (2) hex head bolts (per side) on the underside of the Fuselage fairings. Also disconnect the Aileron Servo wires and Wingtip Lights L.E.D. connectors. The Stabilators can be removed by reference to the BVM assembly manual.